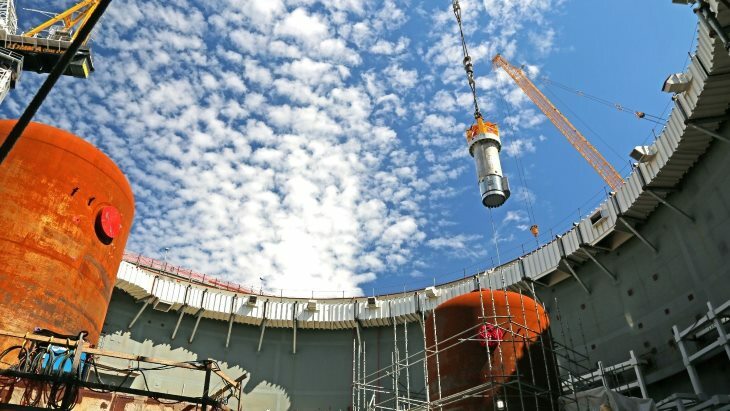 The first reactor coolant pumps have been lifted into place at the Vogtle project, marking another major milestone for the USA's AP1000 construction project. The first of four 375,000-pound (170-tonne) pumps is now inside the containment vessel of unit 3 at the site near Waynesboro, Georgia. The pumps will be mounted to the steam generator and serve a critical part of the reactor coolant system, circulating water from the steam generator to the reactor vessel, allowing sufficient heat transfer for safe plant operation. Other recent milestones at Vogtle 3 include placement of shield building panels around the outside of the unit's containment, with nearly half of the panels for the steel and concrete building now in place. The final floor module for the operating deck inside the containment has also been set. At Vogtle 4, a 60-hour concrete pour inside the containment vessel - dubbed the "Mammoth Placement" - has seen over 2000 cubic yards (1500 cubic metres) of concrete put in place ready for the upcoming installation of the final steam generator and pressuriser. Construction of Vogtle unit 3 began in March 2013 and unit 4 in November the same year. Southern Nuclear and Georgia Power, both subsidiaries of Southern Company, last year took over management of the construction project following Westinghouse's Chapter 11 bankruptcy. Vogtle 3 is currently scheduled to enter service by November 2021 and unit 4 by November 2022.